Kids with sensory processing disorder are easily overwhelmed or anxious about new sights, smells, tastes, touch and sounds. A trip to the dentist involves many new sights and sounds. 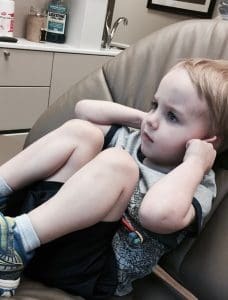 Dentist visits for kids with sensory processing disorder can be especially difficult. It’s difficult, but it’s so important! Good oral hygiene can help prevent future dental and medical problems. 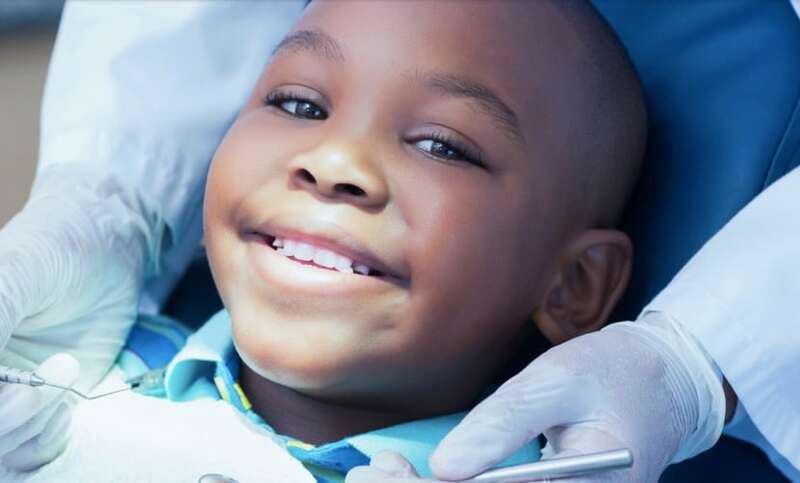 A dentist visit is preventative care and a way to make sure your child’s teeth stay healthy and free of decay. What can parents do to help make the dentist less scary and reduce anxiety? Below are a few ideas to consider before, during, and after the visit to help make it as positive as possible! Read a social story about a trip to the dentist. Find a book or story online about a kid or favorite character going to the dentist . This gives you an opportunity to talk about what the character is feeling and relate it to your own experiences. Social stories are great for all kids, and they are especially helpful to teach kids with sensory processing disorder how to adjust in new settings. Role play a trip to the dentist. One of the best things you can do is role play a visit to the dentist. Pretend you are the dentist and create a complete experience from the chair moving up and down to getting a sticker or treat at the end. Kids with sensory processing disorder are less anxious when they have an idea of what to expect from new experiences. Talk positively about the dentist. Let your kids know the dentist is there to help. He or she has a job to “keep the sugar bugs away” and make sure their teeth stay healthy. Contact the dentist’s office in advance. Let the dentist or hygienist know that your child has sensory processing disorder. They may want to reserve extra time for the visit and have other suggestions as well. This is a good time to ask if you can bring your child’s own toothbrush, toothpaste, and/or flossers. Having their own items will help give them something familiar and comfortable. Schedule a dentist appointment at an ideal time. We all know those times of the day when our kids are more likely to have a meltdown because they are tired and/or hungry. Try to plan an appointment for the time of day when your child is well rested and generally in a more positive mood. Below are some ideas to set your child up for a positive experience during the actual visit. It may be that your child responds well to one of these ideas or a combination, but use past experiences (at the hair salon, at school, at the pediatrician’s office, etc.) to decide what might help the most. If your child is used to headphones, they may be helpful to drown out some of the noises. In fact, a lot of dental offices now encourage patients of all ages to bring earbuds. You can listen to favorite music while getting dental work done! Most dentist offices have a television in the room to play cartoons during the visit. This could provide a distraction and sense of comfort for a child with sensory processing disorder. Take a favorite stuffed animal or blanket for extra security. An xray blanket already at the dentist office is similar to a weighted vest, which helps some children cope with sensory issues. If your dentist is agreeable, it may be helpful for more than just the xray. If this is your child’s first visit, or they are really young, they may just need to sit in your lap. This is how we got through many first haircuts for our son. Sometimes kids just need to feel that sense of security that mom or dad is right there with them. A fidget cube or spinner could be used to help with all of the nervous energy. If your child already uses one at school or home, it could be a welcome distraction at the dentist office too. Whether it’s the treasure box at the dental office, or something you provide, end the dentist visit with a treat. Even if the dentist only got as far as counting their teeth, or your child cried the whole time, find something positive and end with a treat. It’s going to make the next time… and the next… a little easier. This was our first experience at the dentist with our son was three. He let the dentist look at and count his teeth but that was about it. Despite this, the staff loaded him up on toys and acted like he had just had the best visit ever. We ended on a positive so that they could get a little further the next time. Hang in there! Many first experiences for all kids, not just those with sensory processing disorder, are overwhelming. They get easier with time, patience and more maturity! If you’ve found a helpful strategy for helping kids at the dentist office, please feel free to share in the comments! Many thanks to Dr. Simms and the staff at Metro Decatur Dental Group PC for sponsoring this post! Dr. Gary A Simms, along with the rest of the staff at Metro Decatur Dental Group PC believes that when you feel good about yourself, it shows in your appearance. Born in England, but raised in Queens for most of his life, Dr. Gary Simms started his career by obtaining his bachelor’s degree in Science at the University of New York. After getting his degree, Dr. Simms went on to obtain his D.M.D. degree at the University of New Jersey School of Dental Medicine. While at the University of New Jersey, Dr. Simms participated in a number of outreach programs that included visits to Jamaica and the Dominican Republic. Once he completed his dental residency, he opened up his own practice in Bronx, New York, but in 2006, he decided to make the change and move to Georgia, opening up Metro Decatur Dental Group PC. He believes that even a subtle change can help your self-confidence and self-esteem skyrocket. What a helpful article Misty. I’m sure a lot of parents will benefit from this post. Can’t wait to share. So glad it was helpful Miranda! Thank you for sharing!